At Accent Master I find many of my accent redcution clients to be hestiant to use standard reductions in spoken English. They are afraind that they will sound unprofessional, but this is not the case. Use these reductions to you don't accendently reduce in a non standard way such as dropping articles or word endings. Now you may be quick to recognize contractions such as don't, can't, she's, but what about unwritten reductions. Such as gotta, haveta, gonna, useda, hasta, wanna. These reductions also fall under the umbrella of standard reductions. That is right, they are standard. Let alone can you use them, your listener is expecting you to use them. I've gotta go to the store. I have got to go to the store. I am going to talk to him. She hasta finish her work. She has to finish her work. Listen for other speakers using these phrases in their speech. I hope you enjoyed the lesson. 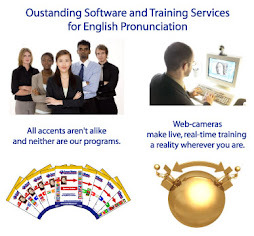 Let me know what else you would like to learn about in English pronunciation! As far as sounds are concerned we have covered /th/, /v/ and /r/. These sounds are what I consider Universal. Meaning that almost all ESL learners will find them challenging. If fact I have created a 1 hour long video just to cover these sounds. If you are interested then contacted my at Lynn@AccentMaster.com. We don't sell it on our Accent Master website yet, it is being released through a company called Video Professor in the future. The exact date of the release we don't know yet. Today I would like to discuss contractions. The common contracts such as it's, we've, don't, couldn't. Often ELL will not use contractions. This can be for a number of reasons. It could be that they are anxious about keeping their verbal sentences grammatically correct or the combination of consonants is tricky or just habit. Even when reading aloud when a contraction comes up, often it is substituted with the full words. For example what is written is don't, but what is said is do not. You may be thinking that it is no big deal as long as the meaning of the sentence remains unchanged. The second is too formal for American English. The other reason to incorporate contractions is that it saves time. It is what is known as a standard reduction. There are in spoken English standard ways to reduce your speech and using contractions is one of many ways we do just that. When you use contractions then it leaves you more time to pick up articles such as "a" and "the". Dropping those articles is called a non-standard reduction, while using contractions is a standard reduction. So today. Choose 1 contraction and use it all day. Similar to a vocabulary building technique. Put a post-it on your computer with the word and find occasion to use it. Stick with one for a week and then move onto a new contraction. So let's continue with the trickiest sounds series! In past posts we covered /r/ and /th/ up next is /v/. This sound is challenging for many including: Cantonese, Czech, Farsi, German, Greek, Gujarati, Hindi, Ilokano, Japanese, Korean, Malayalam, Malaysian, Russian, Spanish, Tagalog, Vietnamese speakers amongst others. So it clearly is worth looking at. The /v/ is commonly substituted with /w/or /b/. So lets look at the features of these three sounds and find what they hold in common and what makes them different. The /v/ is a fricative, the air is released with friction. It is made with the top teeth resting lightly on the bottom lip. The teeth must rest lightly so the air can escape and not be stopped by the teeth. Substituting /w/ for /v/ is far more common, so we will begin there. /w/ is made with the lips rounded and without any of the articulators touching. There is no obstruction to the air flow at all. If you look in the mirror you can see the difference clearly. Relax your facial muscles rest the teeth on the lip and let the air flow out with friction. The /v/ production in fact is the same as with /f/. The only difference between /f/ and /v/ is that you "voice" the /v/. Go from /f/ to /w/ to feel the difference in the position and in the manner that the air is released. At first when you see /v/ in a sentence such as: The violin is very fine. You will find less distortion of the word if you substitute /f/ for /v/. If you are substituting /b/ for /v/, look in the mirror. When you say the sentence "A very violent villain." Are you letting the lips press together and stop the air? Start with the teeth resting on the bottom lip and let the air escape with friction. The difference between /b/ and /v/ is that for /b/ the air is stopped by the lips being pressed together. With /v/ the air is never completely stopped just slightly obstructed causing friction. Luckily both the /w/ and /b/ substitution is easily seen in a mirror. Making practice a bit easier than with the /r/. Write down a few sentence that you say in the course of a day and highlight any /v/'s in the sentence. Practice saying it with your "new" pronunciation. I hope you found this helpful. Please write with any questions or comments, I will be happy to answer! I have been reflecting on what topics have been coming up with my accent reduction clients at Accent Master as of late and it seems as though many are circling back to the sound level. In particular is the /th/,/r/ and s-clusters (such as st,sp,sk). 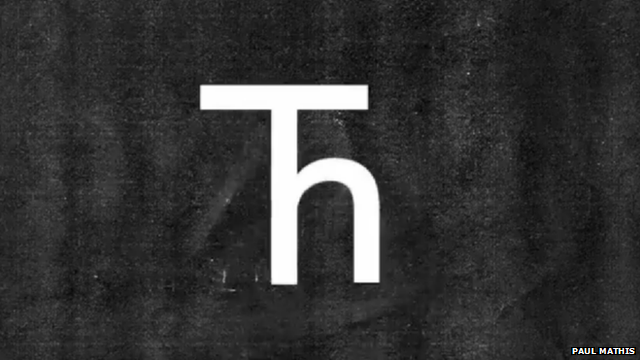 Today I will focus on the /th/(this is not the phonetic symbol, but it is easier to use the letters with the limitations of my keyboard.). I find the mind and its perception and interpretation of the sounds to be quite impressive and the /th/ sound really highlights the minds flexibility. Here is what happens for most ELL, they hear the sound "th" and the brain categorizes it to a fricative and usually accurately decides if it is the voiced /th/ or the unvoiced /th/ (yes there are two!). It observes this through listening as nothing in English spelling will indicate that it is fricative or whether it is the voiced or the unvoiced version of the sound. Now since only English and Greek possess this sound your very smart brain says well then, lets use the closest thing in our inventory that we have. For the voiceless /th/ we will use /s/ for the voiced we will use /z/, this substitution is observed amongst Amharic, Arabic, French,Dutch, Czech, German, Korean and Mandarin speakers to name a few. Others will substitute a /d/ for the voiced /th/ and a /t/ for the voiceless. This still copies the voicing pattern and is quite impressive. In either case the voicing of /th/ is not the issue. If you are replacing /th/ with /s/ or /z/, then simply move your tongue down a 1/4 of an inch and let it protrude slightly form between the teeth. 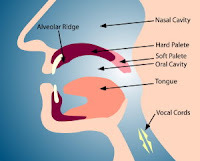 Do not stop the air, just like with /s/ and /z/ let the air come out with friction (why it is called a fricative) of the air pushing between the teeth and the tongue. So the teeth need to rest only lightly on the tongue. It is important that it touch lightly so you don't end up stopping the air flow. If you feel that you are substituting /th/ with /d/ or /t/ then you need to change two features. The first is to lower the tongue 1/4 of an inch and let it protrude slightly from between the teeth. With the teeth only resting lightly on the tongue. The second feature is that the /d/ and the /t/ are sounds known as stops. They are called stops because the air is stopped and then released. With the /th/ you want to keep the air flowing out as, I said above with friction. The air needs to continuously flow out. One reason the /th/ can be tricky is because it takes longer to produce. However /th/ is never reduced. It is always fully produced. Write down a practice sentence and say it in the mirror. Do you see your tongue protruding with each /th/ sound? Keep up the practice. Remember to try to use the sound in your daily speech. Put a note on your computer or switch your watch to a different hand as a way to remember your goal. Good luck! Please respond with questions or comments and I will get back to you!